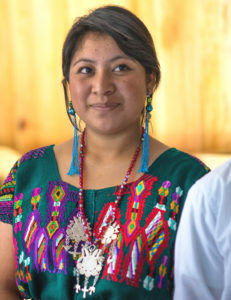 Since Philanthropiece established its Scholars Program in Guatemala in 2012, we’ve accepted 42 young, motivated individuals from the Ixil Region into the program. It has been enlightening to watch as they learn and grow—four have completed their professional Licenciatura, which is the equivalent of a bachelor’s degree in the U.S., and one has completed their Tecnico, which is a technical certificate requiring three years of university study. We currently have 31 active scholars, 28 of which are enrolled in classes. But beyond the academic achievements, it has been inspiring to see how our scholars balance school, work and family obligations. As a way of getting to know our Scholars Program on a more personal level, we’d love to share the story of Karen Santiago, who Jake Matlak, our Associate Director of Programs, had the chance to spend some time with during his recent visit to Guatemala. Karen is finishing her university class studies this year in Psychology and then will be working on her final thesis to receive her Licenciatura. But what makes Karen quite memorable is that in her selection interview four years ago, she actually did not get accepted into the Scholars Program. She received a declination letter along with a handful of other students. Unlike the others, however, she came back to the office and requested a chance to sit down again and discuss why she was not selected. She made a strong case for herself, and based on her attitude and passion, she was accepted into the program. She has been an excellent Scholar since then. This year she was actually hired as an intern, first to support with the Scholars Program, and then with the Social Entrepreneurship Program while another employee was on their maternity leave. Karen has done great work in both of those roles. Karen worked with some of the entrepreneurs in our Social Entrepreneurship Program this year and loved the impact. In her discussion with Marvin, who is opening the first gym in Chajul, she loved when he said that he was a new person after the cultivation. He wanted to be his own boss and run his own business. Karen arranged for Marvin to meet with Jake’s brother, who is a trainer and a gym owner himself. Beyond helping other participants in achieving their dreams, Karen has shown entrepreneurial spirit of her own. Years ago in the Scholars Program, students had access to small loans for more personal needs. Karen took out a Q2,000 ($270) loan, which she used to help her family buy a few chickens and build a coop. With that initial investment, which she paid back years ago, her family now owns a thriving chicken farm. Also in prior years, Scholars had access to an HSA fund where they could save money for emergencies. When the program structure changed and everyone liquidated their accounts, Karen used her savings to help two younger siblings pay for their graduations. We are proud to be a part of Karen’s growth as a changemaker and we look forward to continuing to work with her as she realizes her dreams for herself, her family and her community. Morning Glory Farr is Philanthropiece’s Editor & Content Manager and has served as an Advisory Board member since 2010.